Important: Before starting to install the tune-o-matic bridge posts (or bushings) make sure the neck and fretboard are in their final positions. 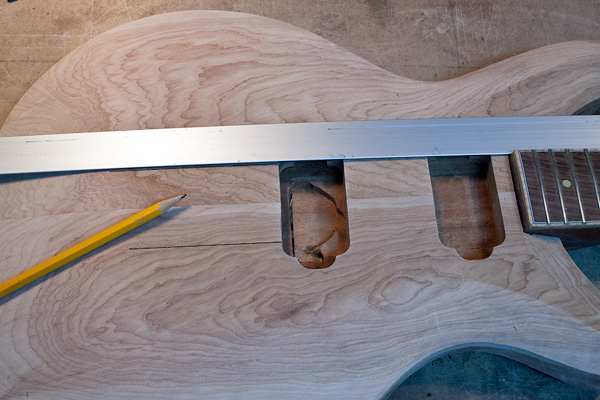 The position of the bridge on the body is highly dependent on the fretboard and the nut. Since the strings vibrate between the nut and the bridge (the scale length) and since the position of the nut is fixed, the exact position of the bridge will determine the correct scale length. Step 1: Alignment. 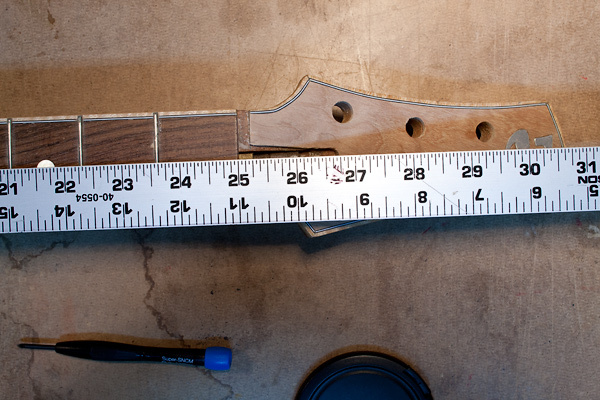 Place a long ruler along the side of the fingerboard and extend the ruler onto the guitar body. Then draw a line on the body. Do the same on the other side. You should end up with two lines that are extensions of the fingerboard (see image). The two lines will *not* be exactly parallel to each other since the fretboard is tapered (narrower at the nut and wider at the body). Step 2: Find the bridge position. 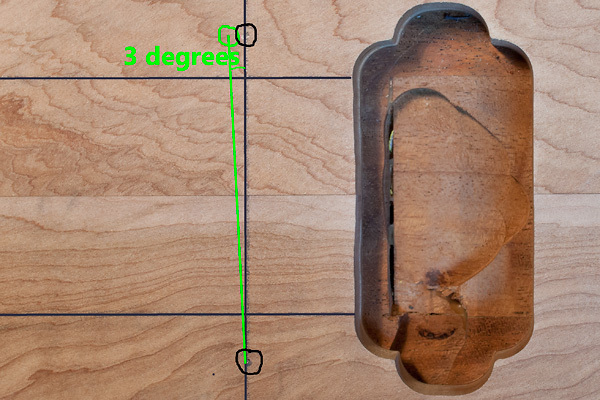 By knowing the scale length, you can now calculate the exact location of the bridge saddles. 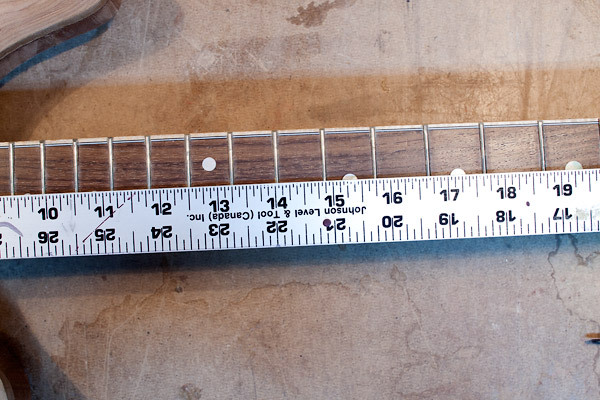 Place a long ruler on the fretboard and align it with the center line. 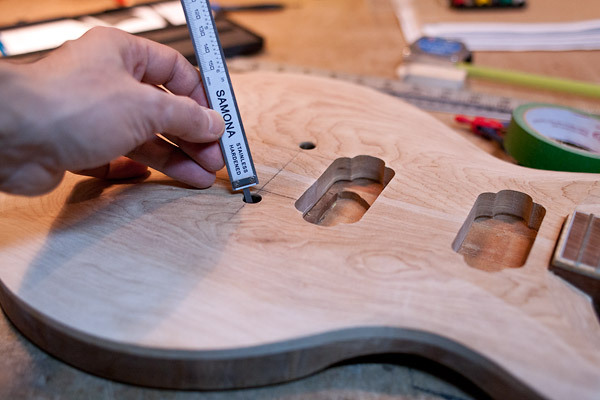 The scale length on this guitar is 25″, so the 25″ mark is placed at the location of the strings over the eventual nut. A scale length of 25″ means that the 12th fret will be at 12.5″ from the nut and 12.5″ from the bridge, meaning the half-way point. The exact position of the bridge saddles can now be located. Before placing the bridge under the ruler and in order to allow for intonation compensation (later during tuning), bring all the saddles at their most forward positions (as shown in the image below) and align them under the ruler. The bridge must now be aligned between the two fretboard lines; you can easily do this by eye, use a ruler or better yet, place a string along the treble E and bass E paths and align the bridge that way. Once the bridge is aligned for scale length and between the fingerboard lines, then mark the locations of the bridge posts using a pencil. On some bridge models, there may not be enough “saddle-room” for correct intonation at the bass-end of the bridge. In that case, it is common practice to shift the bass-end of the bridge a few mm away from the pickups. You can do this by rotating the bridge by 3 degrees around the treble post (see the green line in next figure). This is optional but popular. NOTE: the line draw on the body is not the scale length but rather it marks the position of the bridge posts. Step 3: Drill the holes. Before starting to drill any holes, determine the depth of the holes. Use one of the bridge posts to estimate the depth and place masking tape to identify the depth. Hint: it’s better to drill a slightly deeper hole rather than a slightly shallower hole. 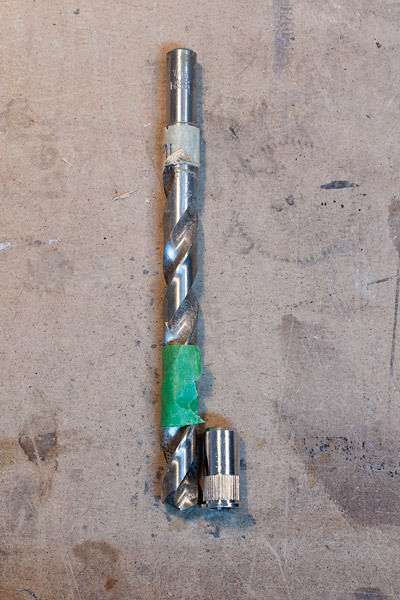 Before drilling, make sure the body is extremely-well clamped-down and will not move during drilling. 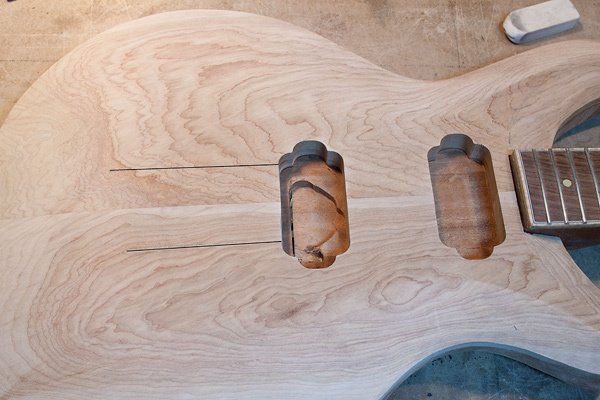 A drilling mistake at this stage of the build can be disastrous for the guitar body and the guitar builder’s mind! Note: check your measurements one more time… make sure the saddles will align with the scale length! Step 4: Verify. At this stage it is wise to check the depth of the holes and also the final alignment. Final alignment verification… everything fits well. Do not install the posts yet if the body is not ready for assembly because removing the posts will be nearly impossible and will damage the holes. The tailpiece is usually 2″ behind the bridge. In this case, I drill the ferrule holes. I would love to hear your comments, ideas and suggestion. Leave a comment below. Hello. I found you doing a google search on locating a bridge on an electric guitar.. I’m putting together a kit soon, but I think I’ll actually build an electric short scale, or shorter than normal scale electric guitar in the future out of wood from Indiana. My brother has a bunch of Walnut / black walnut for bodies and a bunch of birdseye maple for necks.. as well as a wood shop.. So, I’m going to try my hand at building a very simple short scale (23″ or 24″) single cutaway guitar with 22 frets.. Medium tall, etc,.. Thanks so much for this info on the locating the bridge. I have the Melvin Hiscock book on building guitars and it helped a lot, but this is a better way of finding where the bridge should be. Does this work on a Fender hard tail bridge as well ? 1. When you say “short scale” I assume you mean “short scale length”… Unless you know how to calculate fret distances and properly cut fret slots in a fingerboard, I recommend to go with standard electric guitar scale lengths and buy a pre-slotted fingerboard. The big manufacturers have standard scale lengths of 24.75″ for Gibsons, 25″ for PRS and 25.5″ for Fenders (see a great description of scale lengths here http://www.stewmac.com/freeinfo/Fretting/a-scalelength.html ) You can create a guitar with a different scale length for sure, but it also means a lot of work. 2. The Melvin Hiscock book is good but I don’t necessarily think it’s very practical for finding information in an easy manner… It’s written too much like a novel with no separation of subjects… The book that I highly recommend is Building Electric Guitars by Martin Koch. It’s highly detailed, easy to read, many diagrams and more of a step-by-step approach. 3. 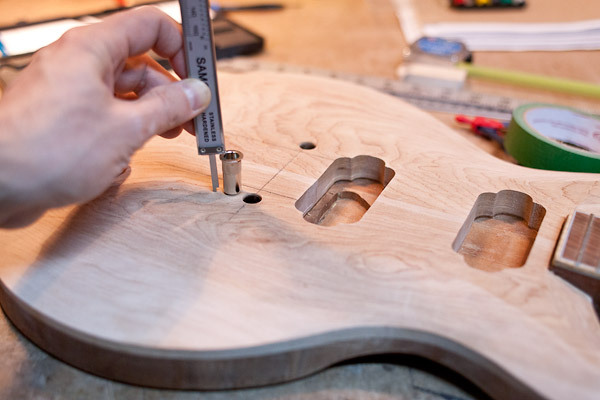 The approach outlined in this article should work for finding the bridge position on any guitar. Just make the necessary modifications for the specific hardware of a Fender bridge type. I have a Gibson les paul double cut away with the whip stop bar tailpiece. What I would like to do is add the tuno’matic bridge. I think the holes that are there will work for the bridge but I would need to drill holes for the stop bar tailpiece. Is that possible? Lots of help thank you! Great pictures too. Perhaps it would be nice to also show the location of the stop tailpiece to finish the job? As requested, I just updated the post to include the tail piece holes. However, on this guitar I have chosen to install ferrules… see last image in article. The tail piece should be 2″ from the bridge (from the center line of the body). the line you’ve drawn that represents where the bridge sits, is that exactly 25.5″ (or whatever scale length) from the edge of the nut? I’m wondering if you have added any “compensation” other that the 3 degrees for the bass side? I keep hearing about people adding compensation but I’m never sure if it is to both sides + the extra on bass OR just the bass side. Yes, the line is drawn exactly at the scale length from the nut. 1. 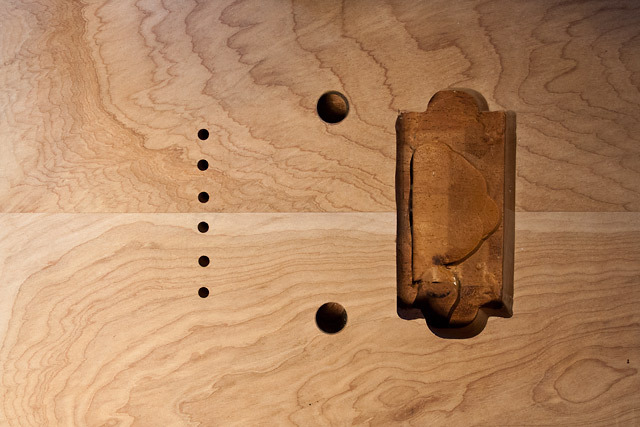 Before finding the final position of the bridge, bring all the saddles on the bridge to their most upfront position (meaning, turn the little screws until the saddles are closest towards the fingerboard). 2. Then place the *saddles* on the line. 3. Mark the two post locations with a pencil and remove the bridge. 4. Calculate the 3 degrees and place a new pencil mark for the new bass-side bridge post location. That’s the final position for the bridge. Hello there and I’m confused whereby in step 1 it says “The two lines should not be parallel to each other …..” , yet the photo for that step says “Draw two lines parallel to the fingerboard” – please advise, thanks. I can see how that wording can lead to confusion. The two lines are parallel to the fingerboard but not parallel to each other. That’s because the width of the fingerboard is smaller on the nut side and wider on the body side. So the lines will get progressively further from each other. I changed the description on the image to remove the confusion. I caught this article just in the nick of time before drilling these holes for the posts. Whew ! Only after reading this did I see all the dangers involved. I will read it again and again before drilling. Thank you – the best guide on the net. I’m glad this article was helpful to you. Let me know if you have any specific questions. Hello, so all scales are a minimum? Like 25.503″-25.579″ for example. And are shortest on the treble side? I have a schaller that has an angle built in. If I make the 1st string@ scale then no other string can be. Is this correct? Hi very nice and clear description, one of the best on the net. But i have to make you question for a GTB series bridges by Wilkinson, and it’s adjustable G and B Saddle,. Should I drill posts like in your description with 3 degree angled or should I drill them straight and parallel to pick up cavities? That’s my doubt Hamlet! . I’m building a Prs style guitar. And any advice in bridge change? i heard that is better the on with individual saddle adjustment! Thanks in advance! Hope you anser soon. I would to spray my guitar!! Have a nice evening! The type of bridge you mention requires the two outer E strings to be correctly positioned first, and then the inner strings will be more or less correctly placed and you can fine tune them with the adjustable saddles. So the question is, how to get the correct placement of the bridge posts so that the two outer E strings are placed correctly? 1) You need to simulate the finished guitar by putting on the tuners, the nut, and then placing the bridge at about the right location on the body (place a shim under the bridge to mimic the bridge post studs). No drilling at this point, just place it on the body. 2) Then insert the two outer strings from the tuners, over the nut and over the bridge. You will need to figure out a way to hold the strings in place in order to tune them to correct pitch (see this video for an idea https://youtu.be/-QXLfAIHjnI…). 3) Now, move the bridge by hand until the outer E strings are correctly tuned… that’s your final bridge post locations. I hope what I said makes sense to you. The video link is a great help. The main issue I can foresee though, is how to keep the strings stretched on your particular bridge type. One idea I have is to clamp a piece of wood on a bench, hammer in, partially, two nails and hook the strings on them and then over the bridge saddles, over the nut and into the tuners. You mention that you should “bring all the saddles at their most forward positions” and place them at the proper location (centered on the scale length). I have found other sources that say to set the saddles in their center position before placing the bridge. With your method there can be no intonation adjustment to a slightly shorter scale length — is this okay? I believe your method is correct because all intonation adjustments have to compensate for a string thickness of greater than zero which means that all intonation adjustment has to be “scale length plus some adjustment” and never “scale length minus some adjustment”. Is this correct? I’m just looking for some clarification since I have found many other sources that suggest setting saddles at the center of their adjustment point. I was hoping to find a reply to your question, as I had exactly the same question: what’s the logic behind determining bridge location with all saddles full-forward (shortest scale length) position? I assume there’s a clear answer, eg, that’s exactly twice the length of nut to 12th fret, so only string thickness causes a need to deviate and that will always be added length rather than subtracted….but I’m kind of guessing about that! The reason to bring the saddles all the way forward is because intonation adjustments will always be performed by lengthening the strings, i.e. by moving the saddles away from the nut. 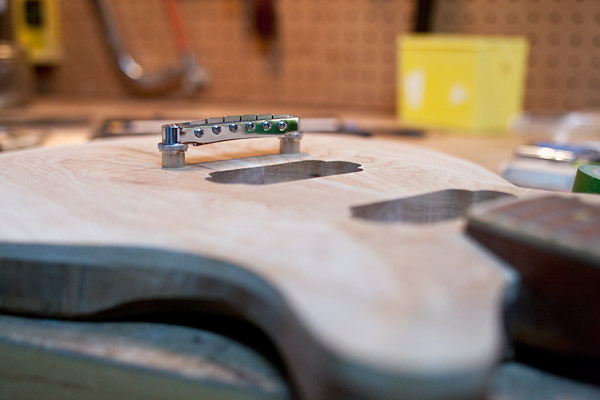 By bringing the saddles forward during bridge installation, that gives you more room for intonation correction later. Thank you so much for the info! I have a question about bridge placement and neck angle. 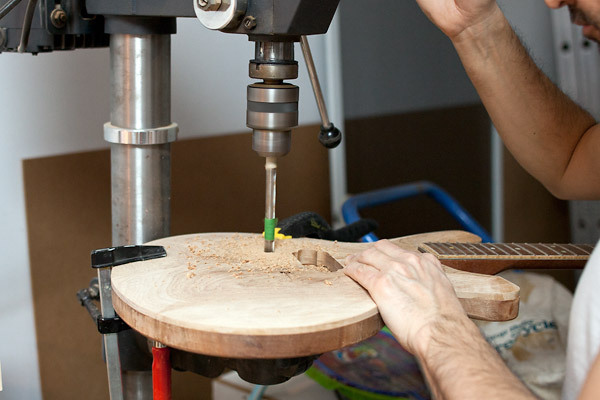 In the article, you mention that the neck has to be in the final position before starting the bridge locating process. My question is, how do you know what neck angle to create before the bridge is installed? Doesn’t the neck angle differ with the type of bridge you decide to use? What if you have to raise or lower the bridge? Wouldn’t that affect the correct neck angle? I’ve seen info online with varying degrees of neck angle, from 2 degrees up to 7 degrees or more. Is there a standard neck angle number when using a certain type of bridge? If not, how do you calculate the neck angle to use if you may have to adjust bridge height later in the build? Hello I am building my first guitar and I plan on a neck thru 25.5 scale with a tune o matic bridge .I was just wondering what neck angle would be good to use. The neck angle is mainly determined by the height of the bridge above the surface with respect to the height of the fretboard. The best way to determine the correct neck angle is to draw a full scale side-view plan of the guitar. Draw the body, the tune-o-matic bridge, the neck, the fretboard and even the heights of the frets… then you’ll know what neck angle needs to be. Hi Marcin, Sorry to hear about your problems… but I don’t understand why!? I’ve done this process on many guitars and it works perfectly every time and no one else has ever complained about the method. There’s nothing really special about installing a TOM bridge, even though new builders are terrified of the process, it’s simply about drilling the bridge posts so that the saddles are at the correct distance from the nut, that’s it. I don’t think a recessed bridge should change anything but maybe I’m wrong…!? Did you bring all the saddles forward before calculating the position of the bridge? 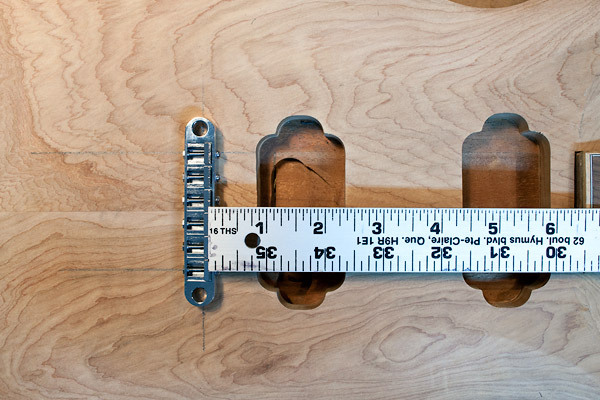 Did you place the bridge saddles at the correct scale length for your design? Intonation issues can also arise from improper nut slots, something to check. Even if the bridge is slightly off, you should still be able to intonate. The fact that you’re having intonation issues means that something is very wrong. The problem is that I did it step by step accordingly to Your manual. 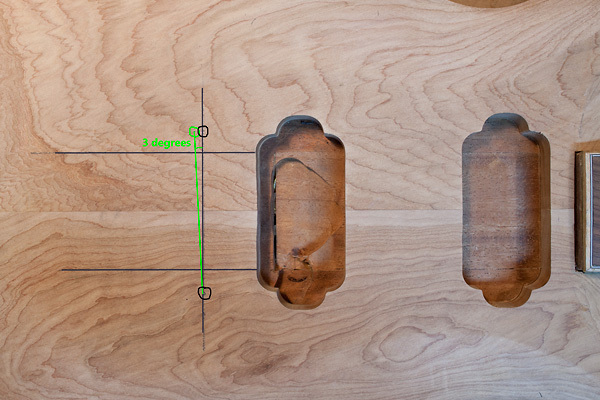 Saddles to edge (pickup side edge ]) placed on scale length end (24,75), pins marked, 3 degrees added to bass pin. I did I t twice, and both guitars have the same issue, bass strings (E and A) are on the bridge edge, and I am not able to set up d string. Violins are OK but also on pickup side of bridge. As U know when lowering action, U gave to change intonation to pickup side … so when action is low, unable to set intonation on D. When I am setting g 3 mm on 21 fret, it is quite OK, but … U know, then guitar is not so friendly to play. So I had to move bridge 3-4 mm to pickup. I believe that if I would set saddles in middle of bridge (not on pickup side) while marking pins, it would be OK.
Hi Araz, what drill measure should I use for the holes for the bridge Studs? The diameter is slightly going wider at the end of the stud. Must i use a rubber hammer, or press with some ‘crick’? Yes, holes for the studs need to be tight enough that you will need to hammer or press them in (you can put a bit of wax so they enter more easily).